SQL compatibility – Java, SQL and jOOQ. Oracle. 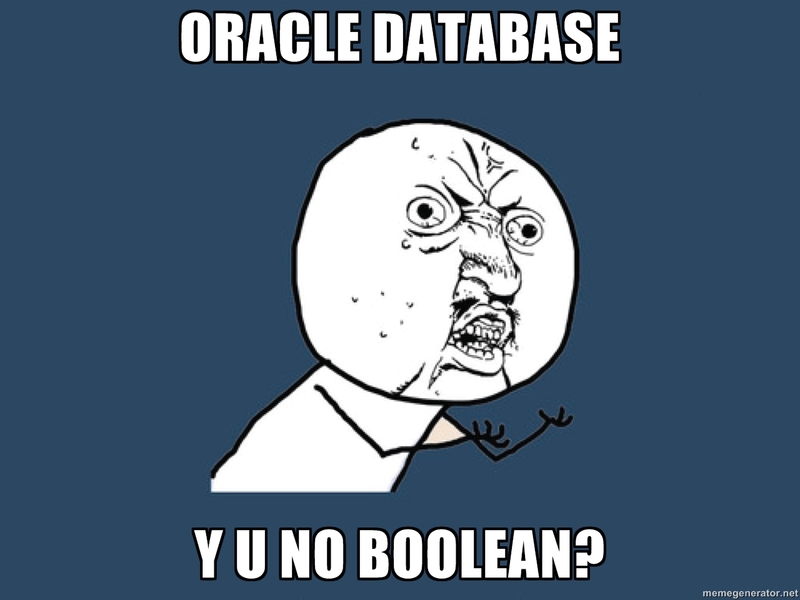 Why U No Boolean? People have worked around this limitation by using numeric or string literals instead. For instance 1 / 0, Y / N, T / F or the SQL standard 'true' / 'false'. From a JDBC API perspective, boolean values can be set as bind values through PreparedStatement.setBoolean() or fetched from result sets through ResultSet.getBoolean(), and similar methods. If your database supports booleans, the Java boolean type nicely maps to SQL BOOLEAN – even if Java’s Boolean wrapper type would have been a better fit to respect NULLs. So, most Open Source databases show what could be interpreted as the “correct” behaviour, even if from a historic perspective, 1/0 should be accepted behaviours. Beware of this limitation when using an Open Source test database! For more information about this and the H2 database, please refer to this thread on the H2 user group. Recently, we’ve added support for the MS Access database in jOOQ 3.3. This may well have been our hardest integration so far. The MS Access database has its ways, and many of them, too. But luckily, jOOQ’s internal SQL transformation abilities are already very advanced, as we’ve shown previously in a blog post about the emulation of row value expression IN predicates. In this post here, we want to show you how we can emulate a multi-value INSERT statement transparently through various steps until it works also for MS Access. But this syntax is not supported, again, by MS Access as you can see in the manual. tableexpression: The name of the table or tables from which records are inserted. This argument can be a single table name or a compound resulting from an INNER JOIN, LEFT JOIN, or RIGHT JOIN operation or a saved query. So we need to explicitly select each column from our newly created derived table. But those columns don’t have names (yet). The standard way to assign names to a derived table’s columns is by using derived column lists, which rename both the table and all of its columns in one go. We’ve previously blogged about this here. Now ain’t that a beauty!? In real life, you would probably work around this limitation in one way or another because no one manually writes (or reads and maintains) such SQL. You would probably resort to multiple executions of single-record INSERT statements, to batch processing, or whatever. But in real life, you would also support SQL Server or Oracle or some other database in addition to MS Access, and you’d constantly run into these kinds of issues which you’d have to patch manually. This can get very frustrating! … which works precisely like this in all of jOOQ’s 16 supported RDBMS. What are you waiting for?